Whatever happened to Steven Spielberg? Yes, I’m a pretentious film geek who salivates at the sound of “Criterion Collection”. I like Bergman’s The Seventh Seal (a little known Swedish children’s movie about a boy and a seal at the local circus – it’s basically Free Ølåf) and Fellini’s La Strada – but I love the great popcorn movies. For me, there are two almost perfect representatives of that hallowed group of films: Raiders of the Lost Ark and Jaws. What happened to the man who made those films, though? Spielberg is still one of the best craftsmen in Hollywood, but the thing that was exhilarating about his early films was their sheer energy. There was a joy to the filmmaking, a childlike sense of fun, that made Spielberg unique. It’s there in the two films mentioned, and it’s also there in E.T. (mixed with a generous dollop of sentimentality) and Close Encounters of the Third Kind – but the biggest failure of Indiana Jones and the Kingdom of the Crystal Skull was that it was tired and felt forced. There was little of the exhilaration of the earlier films in the series, especially of the first. Obviously this could be attributed to Indy having aged himself, but that’s a disappointingly humdrum explanation that pretty much begs the question: why have a fourth Indy movie in the first place? The much-ridiculed CGI retouching of E.T., replacing guns with walkie-talkies is symptomatic of this fretful, overly squeamish Spielberg. The BMX chase in the original version of E.T. is exciting, and the moment when they get out the guns, we know: Uh oh. Something bad could happen. Compare the same moment in the ‘remastered’ version, where the impression we get is that the worst that could happen is, they might be caught by the grown-ups and given a severe talking-to. Where’s the danger? Where’s the sense of actual risk? If you take that away, characters that we care about become invincible video game characters with the god mode turned on. I’m in a minority in that I quite liked much of War of the Worlds, but it’s a prime example of a film that suffers from Spielberg’s “playing it safe” doctrine. It’s pretty clear, in every single scene, that he wouldn’t kill off Dakota Fanning – and while her brother puts himself in a situation where he’s almost sure to die, we get an unbelievable, corny deus ex ending that many filmmakers who are much less skilled than Spielberg would have scoffed at. Obviously Spielberg isn’t the young man he was when he made Jaws or Raiders. He’s older now, so it’s only to be expected… but did he have to become so damn po-faced? Where’s the glee? Reduce Spielberg to his (considerable) skill while taking away his sense of joy and adventure, and you get Zombie Spielberg. And everyone knows that only Godzilla Lucas can fight Zombie Spielberg. 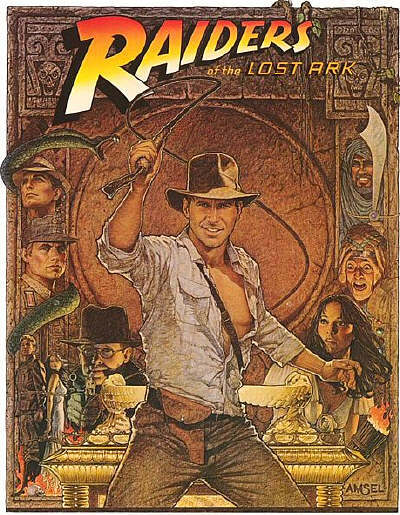 My favourite one of the films was always Raiders. It had a magic, a rawness and an energy that the others don’t match. Last Crusade is the funnier film, but it comes dangerously close to self-parody – added to which, well, it’s pretty much a rip-off of Raiders. So many of the scenes made me think, “Yeah, cool, but haven’t I seen this one already?” You get the same type of intro sequence, followed by scenes at Barnett College, followed by the story proper. You’ve got rats instead of snakes. You’ve got the wrath of God visited on those undeserving. And all of it tries just a bit too hard to be funny. Last Crusade fares worst when it comes to the side characters that were introduced in Raiders. Both Sallah and Marcus Brody are turned into jokes – and they aren’t particularly good jokes. If it wasn’t for the interplay between Indy and his father, Last Crusade wouldn’t be much better than, say, The Mummy or any other Indiana Jones rip-offs. Now, finally, Spielberg, Lucas and Ford got their act together and made a fourth film. Lots of fans hated it. Correction: lots of fans hated it on the internet. There’s something about Web 2.0 that brings out the extremist in fanboys and nerds. 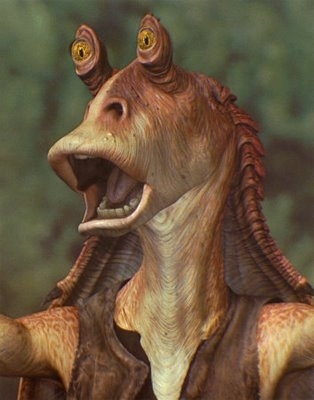 Something can’t be pretty good or sort of bad – it’s all either perfect, worthy of geekgasms, or utter shite of the “George Lucas raped my childhood!” ilk. There’s little to no motivation for Indy. He’s only reacting to what’s happening. For a hero, he’s pretty damn passive. Compare that with Raiders, where something is actually at stake for him. Here the baddies have ten times more of a motivation to do what they do. Indy’s just along for the ride, really. What happened to the guy who got shot, who bled, who looked worse for wear after his big scenes? Indy’s always survived things that no real human being would survive – but he was never indestructible. Here, one of the first things we see the man do is survive an atomic blast. Yes, it’s funny. Yes, it’s one hell of a cool image. But if a hero isn’t touched by a nuclear explosion, well, are we supposed to be thrilled when he’s being chased by bumbling Russian soldiers? David Koepp, the script writer, didn’t really know what to do with his characters. Many of them are utterly unnecessary for the plot and take time away from one another. Was Mac necessary? Not really. The Russians could have done what they did without him. Oxley? He was basically a talking version of Last Crusade‘s Grail diary. Even Marion, although she had some nice scenes, was basically wasted, as was Mutt. There was no urgent reason why any of these characters were in the film – and if you’re making what should be a rollercoaster ride of a film, superfluous characters slow you down. I don’t have any problems with aliens instead of religious artefacts – if they’re intriguing. The Ark of the Covenant had mystery, it felt positively alive. (It was also helped by John Williams’ wonderful score, which I’ll talk about in the next bullet.) The Grail was already much less interesting, but Last Crusade didn’t focus on it: it focused on Indy and his father. The crystal skull? It’s a pretty uninteresting gizmo. It doesn’t have much character. And the ending pretty much lacked awe… which the Ark had in spades. I don’t remember a single one of the new tunes Williams penned for Crystal Skull. All three former Indiana Jones movies had memorable tracks, and the Raiders March is one of the most iconic pieces of film music there is. I can’t remember the last time Williams wrote music that didn’t feel like B-sides. The man wrote some of the most memorable film scores – but from what he’s been producing in the last, say, ten years, he should finally retire. The villains… Raiders had its iconic Nazis, and it had Belloq, to date still by far the best adversary Indy ever had – because he wasn’t actually that different from the man. Belloq had a great introduction, his interactions with Indy were well written and acted, and he actually had charisma. Cate Blanchett tries hard, but the script doesn’t know what to do with her. Is she evil? Driven? Obsessed? Is she actually a tragic figure? I don’t mind ambivalent characters, but I mind scripts that seem to have an attention span of five minutes. Koepp didn’t really seem to have much of a concept of any of the characters… which is probably why the film feels mostly like a string of episodes, none of which are really terribly compelling. And what’s Indy without a good adversary? Anyway, the film’s had enough of a critical pummeling. All in all, it was entertaining enough, but not much more so than a competent Indiana Jones knock-off. And somehow mediocrity is almost worse than an out-right bad Indy movie. I just hope that Lucas and Spielberg won’t try to keep flogging this almost-dead horse. At some point it becomes terribly, terribly undignified. And talking of undignified: have fun with this!